This Friday, try a pair of cocktails that fit in with the Rat Pack or Mad Men set…the Rusty Nail and B&Bs. I’ve always connected these two cocktails with my father as they have been his signature drink. In recent years, it’s been the Rusty Nail more frequently, but years ago, I remember him ordering B&Bs with equal frequency. Both drinks are super easy to make, but neither is easy to drink unless you’ve acquired a taste for them. The Rusty Nail—a favorite of the Rat Pack—dates to the early 1960s, but doesn’t appear in the 1964 edition of Old Mr. Boston De Luxe Official Bartender’s Guide. However, it is in an edition issued a decade later. Two special ingredients are required for these cocktails. Dating to 1937, Drambuie is “a unique blend of aged scotch whisky, spices and heather honey,” according to the label. Bénédictine, an herbal liqueur, was created in the 19th century by Alexander Le Grand. The DOM on the bottle is “Deo Optimo Maximo” abbreviated and alludes to the Benedictine Order, perhaps to suggest an older pedigree. The advent of blending Bénédictine with brandy—and thus creating the B&B cocktail—dates to the 1930s. Nowadays, you can get Bénédictine premixed with brandy, but it won’t have the subtleties of using a separate, select brandy of choice. In an old fashioned (or rocks glass), add a few cubes of ice. Then pour equal portions of Drambuie and scotch. An ounce each is a generous portion. Stir a little before serving. In a snifter glass, pour in equal portions. First add the Bénédictine and then attempt to float the brandy on top. Some recipes call for cognac instead of brandy. How I like it: In making these, I find I like Drambuie on its own. It’s strong but flavorful with honey undertones. Together, with Scotch though is a different matter. 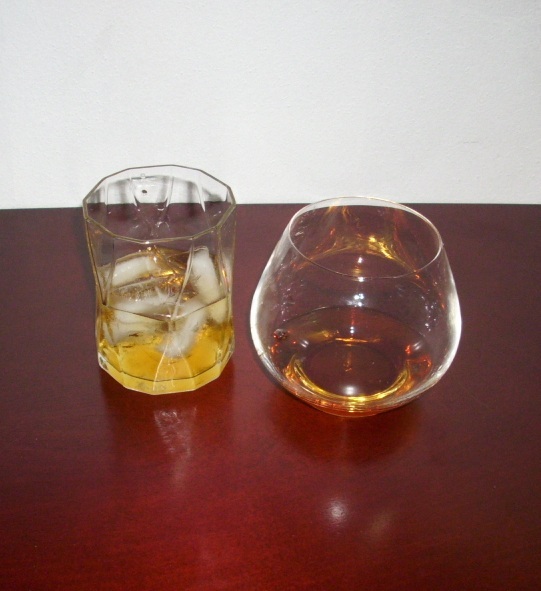 For the Rusty Nail, an excellent blended scotch is absolutely required, and for me, it must be on the rocks. I used Dewar’s “White Label” for the one picture and actually liked it! B&Bs are strong both in vapors and taste. To smooth the experience—and make it a tad sweeter—I used Apricot brandy. A true B & B though is best made with cognac. This is the drink to give to those who need a pick me up or want to warm up in colder weather. Both are sipping drinks, so take your time to savor them. Happy Father’s Day, and remember to drink responsibly!